According to a new study, patients who opt for an extrapleural pneumonectomy (EPP) may lose a significant amount of their lung function. Because the procedure removes one full lung and its lining, that’s not completely unexpected. However, many patients have a much harder time breathing after their operation — and that’s saying a lot, considering the amount of stress mesothelioma tumors place on the respiratory system. Researchers at the University Medical Center in Freiburg, Germany followed 48 mesothelioma patients through their surgical journey. Twenty-five of the patients opted for an extrapleural pneumonectomy, while 23 received a pleurectomy/decortication (PD). Phone interviews revealed that most of the patients in the pleurectomy/decortication group retained their pulmonary function after the procedure. However, the extrapleural pneumonectomy group lost a significant amount of their lung capacity. In the EPP group, patients had an average preoperative lung capacity of 4.8 liters. 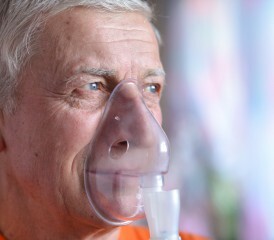 Lung capacity is the amount of air that a person can inhale when filling their lungs to the max. After the patients underwent their surgeries, the average lung capacity fell to 3.5 liters  a decrease of more than 25 percent. The researchers agreed that this loss of lung function often lead to an increase in dyspnea, or shortness of breath. As one of the most common mesothelioma symptoms, dyspnea affects many patients at some point; but the study researchers noted that the severity of the post-operative dyspnea was especially likely to reduce the patients’ quality of life. However, for some, it’s a small price to pay for a chance at survival. Karen Roberts received an extrapleural pneumonectomy for her pleural mesothelioma in 2006. At the time, she was leading a very active life  but found it challenging to regain her activity level after the surgery. But with some persistence  and a little time  Karen feels like her lung function has returned to its preoperative state. That’s not to say that her lung function is exactly the same as it was before her operation. “When [I] first start the workout, [I] need extra oxygen. It takes a little longer, and I get winded. But other than that, I feel truly blessed to still be breathing,” Roberts shared. For the first few days after surgery, patients will likely stay under supervision at the hospital. This lets the surgical team monitor recovery, and allows for access to ventilators and other respiratory support. Once the surgeon releases the patient from the hospital, a respiratory rehabilitation program can help the patient regain (and improve) respiratory function. These programs integrate medical technology, supervised exercise therapy and health care education. Most participants note that the techniques help improve their symptom control, as well as their ability to perform activities of daily living.